What could the Government of Canada do to reduce precarious employment and create good jobs? Liberal MP for Sault Ste. Marie Terry Sheehan has introduced a motion calling on the federal government to develop a definition of precarious employment. While not a substitute for action to reduce precarity, defining and measuring insecurity at work is a potentially useful step. Insecure, under-paid work is a large and growing concern in Canada. Millions of workers in Canada, amounting to anywhere from one-third to one-half of the workforce, are directly affected by precarious work. Vulnerable workers in the shadow economy: is there an app for that? Non-standard or contingent forms of work are a growing feature of OECD economies. Katz and Krueger (2016), for instance, find that non-standard work arrangements (temporary help agency workers, on-call workers, contract company workers, and independent contractors or freelancers) accounted for all net employment growth in the U.S. economy between 2005 and 2015. Across the OECD, non-standard work now makes up a third of total employment. Newfoundland and Labrador’s provincial 2016/17 budget will be tabled this afternoon and there’s concern about what it will include. Everyone expects some tax and revenue hikes and spending cuts to deal with the deficit most recently forecast at $2.4 billion. There’s a lot of speculation about what the government will include in this budget. Then there will be more about what will be in the second budget the Minister said will be coming later this year. One thing it shouldn’t include are cuts to public sector jobs because that will just make the situation worse. The province’s unemployment rate has increased above 14% in the last few months, a rate it hasn’t experience since 2010. This rate very well may get worse as more unemployed workers return from Alberta. There may be a misconception that public sector employment in the province has expanded as the economy was doing well and revenues were flowing in but in fact the opposite is true. Public sector employment in Newfoundland and Labrador is actually now at a record low as a share of total employment in the province and is down by 18% in terms of actual jobs from just three years ago. 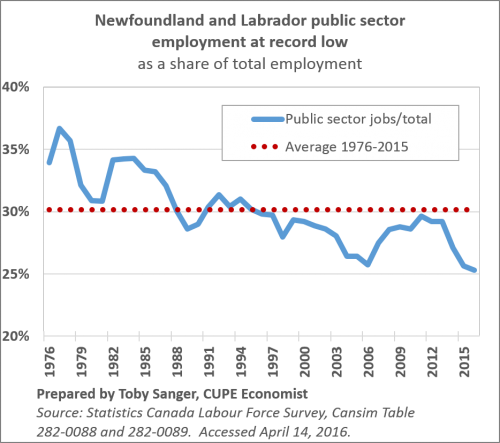 In the first quarter of 2016, there were and average of 58,400 public sector workers in Newfoundland and Labrador. This is a drop of -12,600 or 18% from the 71,000 public sector workers recorded in the province in 2013, according to Statistics Canada’s Labour Force Survey (Cansim tables 282-0088 and 282-0089). Public sector employment in the province dropped to a 25.3% share of total employment in the province in the first quarter of this year. This is the lowest it has been since these figures were first collected 40 years ago (see chart) and well below the 40 year average of 30.2%. If they were just at this long-term average, there would be 69,700 public sector workers in the province: more than 11,000 than there are now. This means fewer public sector workers are working harder to deliver the public services for Newfoundlanders. These needs will increase as unemployment rises and the province is in recession. Further cuts to public sector jobs will not only mean cuts to public services, but will also have a terribly negative impact on other jobs in the province. Every ten jobs cut in the public sector will lead to about another 5 jobs lost in the private and public sector in the provinces, according to employment multipliers from Statistics Canada. As federal Finance minister Bill Morneau stated, “The right approach is to invest in the economy” and not to cut spending. There’s good opportunity to generate additional revenues because Newfoundland’s tax rates were cut during the boom times. Estimates are the province could generate an additional $800 million annually by aligning its tax rates with other provinces and adopting a more progressive tax system. Tax increases, especially for high incomes and corporations, have a much smaller negative impact on the economy than spending cuts do. National Migrant Workers Coalition Launched!